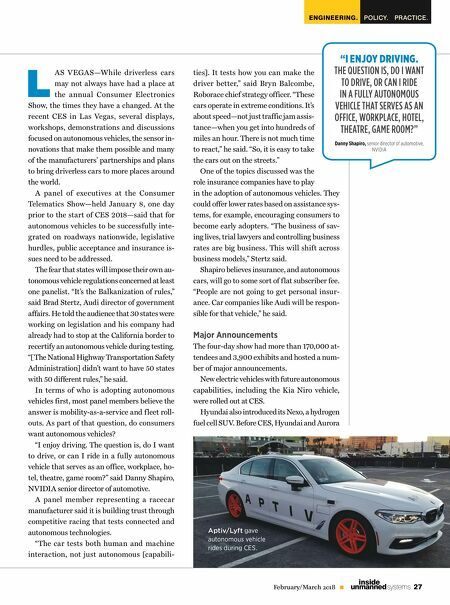 GROUND INDUSTRY UPDATE 26 February/March 2018 unmanned systems inside Autonomous vehicles were highlighted at the Consumer Electronics Show with panelists focusing on integration of driverless cars and the increasingly important roll of LiDAR. by Kevin Dennehy Photos courtesy of Kevin Dennehy and Live Stream Video from SpaceX Falcon Heavy and Tesla. 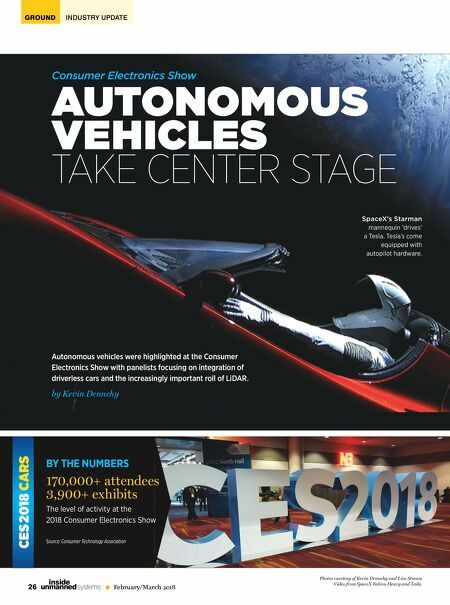 AUTONOMOUS VEHICLES TAKE CENTER STAGE Consumer Electronics Show CES 2018 CARS Source: Consumer Technology Association BY THE NUMBERS 170,000+ attendees 3,900+ exhibits The level of activity at the 2018 Consumer Electronics Show SpaceX's Starman mannequin 'drives' a Tesla. Tesla's come equipped with autopilot hardware.